What the heck, you ask, is InCoWriMo? I asked the same thing and when I found out, I jumped in with both feet. InCoWriMo is short for International Correspondence Writing Month. The whole idea is to write one letter every day for an entire month. Thankfully, the month chosen is February, the shortest month. Seeing as I’m already a member of Postcrossing, a worldwide post card exchange, and I love my fountain pens and am looking for any reason to use them, this is a natural progression. So far, I have 18 people slated to receive some kind of handwritten correspondence, some through Postcrossing, some through other forums I’m on. Want to learn more? You can check out the web page here. Why not consider joining me? It doesn’t have to be a letter, per se, just correspondence of some kind… a letter, a note, a postcard… whatever. You just have to write one every day. You can mail it, you can hand deliver it, either way is fine. And, honestly? Everyone loves getting mail that isn’t a bill.Don’t you? Would you like to get a letter/note from me? Email me your snail mail address at peridot1454 at gmail dot com and I’ll add you to my list. Or ask me for my address so you can send ME some snail mail. Today’s post is about knitting but it isn’t. Or, I could say that it isn’t about knitting but it is. Oh, let’s just get on with it. You probably know, because I’m sure I’ve mentioned it a few times, that I’m involved with Postcrossing, a world wide postcard exchange. If you’re not familiar with it, do check it out; it’s a lot of fun! Anyway, this week I received the perfect postcard, from one knitter to another. I just had to share here, because even though I’ve already posted about it on my Postcrossing blog (It Only Takes a Stamp), it’s about knitting. Is this not the perfect card for one knitter to send another? 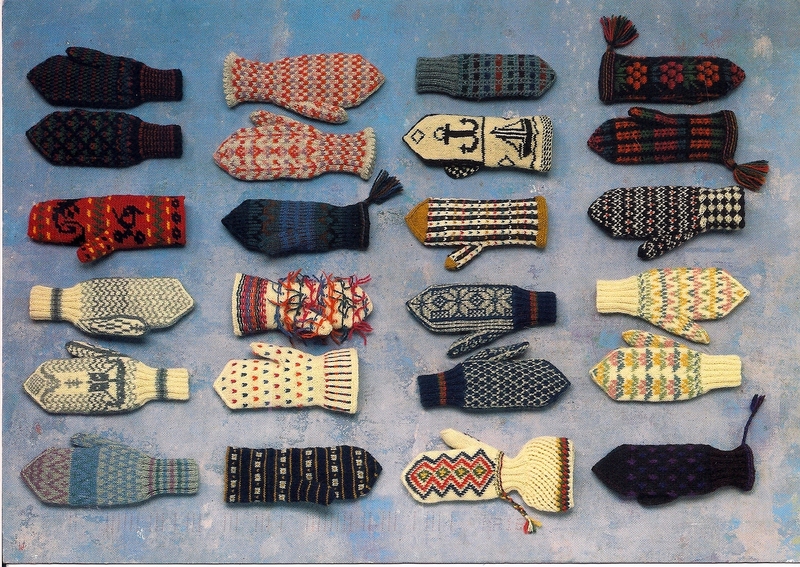 The mittens, according to Pirkko, the sender, are “provincial mittens from Finland”. Pirkko has four grandchildren and both knits and crochets. She also makes bobbin lace and tats, neither of which I know how to do. Check out the inside out mitten in the second column from the left! Threads have been left hanging; I assume that would provide a little more warmth. Isn’t this the perfect inspirational card for any knitter? I can definitely see myself referring to this postcard for inspiration for a long time to come. I’ve been trying to decide which pair of mittens I like the most but I just can’t. I really like the one at the top right but I also like the mate of the inside out mitten; and then there’s the subtle colour work of the one at the bottom left. What about you? Is there one that particularly jumps out at you? Speaking of knitting, there’s been absolutely none happening around here this past week. It’s been a busy one around here. John’s boss was here for a few nights, then my daughter arrived for two nights. I won’t say much about her visit at this point except to say that it was wonderful to be able to spend some mother/daughter time with her, short as her visit was. Now that things have settled down again, though, I’m hoping to get those needles clicking furiously!